Some lucky comic fan owns this sweet commission, which was drawn by the one, the only, Kevin Maguire, and inked by Joe Rubinstein. 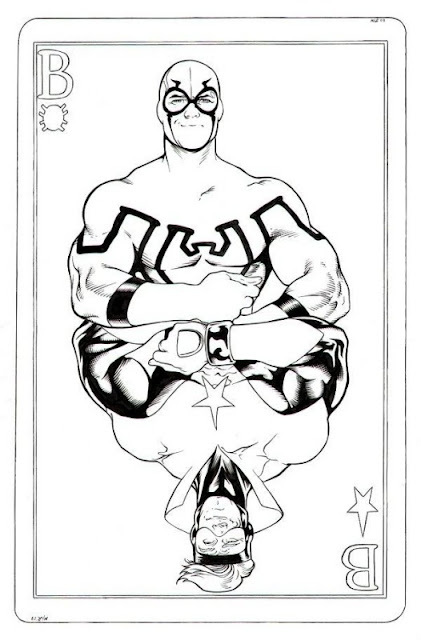 I think Keven Maguire should make a whole series of JLI playing cards. Wouldn't that be awesome?! Wow! This is pretty awesome! For a second there, you had me thinking Ted Kords was coming back to the DCU and this was a cover to JLGeneration Lost/Booster Gold! Be still my heart. I'd KILL for an entire set of playing cards by Maguire. Come to think of it, I don't think I've every seen any superhero/JLA playing cards. Though I'm sure there's probably some out there. Ah! Love it! ...& I know what you mean about playing cards if they had superheroes, I'm like that with video games - it can be almost the same concept as another non-superhero game but I only want to play if I can be a superhero. I actually have a pack of X-Men cards that's around somewhere. Basically the Jim Lee era. They're pretty cool actually. It doesn't take luck,just commission me.